So far, so good. It’s day three, and I’ve managed to steer clear of cookies, candy, and potato chips. My willpower probably won’t be tested until I hit day 10 or so. This process reminds me that I prefer to eat healthy, whole foods prepared myself, but I get caught up in convenience and years of bad habits. We are programmed to crave sugary, greasy fattening foods. It does take more time and a little bit of planning but eating healthy and cooking most of your meals should be enjoyable, not a chore. I could eat a salad every day and never get tired of them. The one thing I could to without is all the cleaning, chopping, and cutting that has to happen. I find that if I prep a few days worth of greens and veggies and have them ready to go I am much more likely to throw a salad together rather than grab take-out on the way home. This recipe is one that I’ve been making on and off for a few years, and I love it. 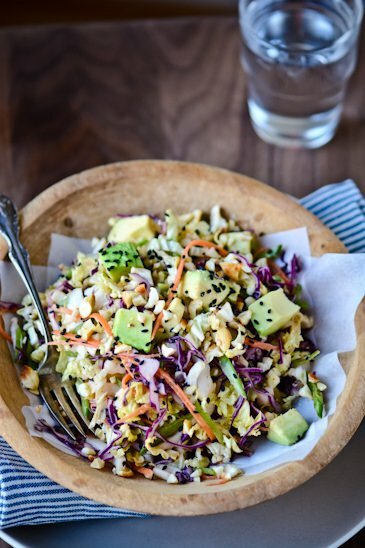 Crunchy Asian cabbage, sweet carrots, creamy avocados and nutty cashews topped with a spicy peanut dressing makes this one of my favorites. I don’t like to press my readers into buying a lot of products, but I highly recommend investing in a mandolin if you don’t have one. My favorite is by Benriner and will run you less than $25.00. It takes up almost no room, is easy to clean and with three separate blades, incredibly versatile. Having a mandoline slicer will save you the hassle of lugging out your food processor and will give you the most lovely looking salad in the neighborhood. Being able to quickly and finely shred vegetables will make you much more likely to include them in your cooking. They Feel free to adjust or add your favorite veggies or protein to the mix. Sliced red pepper, shelled edamame or some shrimp or chicken all make great additions. The one thing you don’t want to omit are the fresh herbs; they add a lot of flavors that compliment all the vegetables. Lightly dress the salad and taste it before adding more dressing, a little goes a long way, and leftovers are great to use a dip for spring rolls. Combine the cabbages, carrots, snow peas, avocado and half the herbs in a large bowl. Whisk together all the ingredients for the dressing in a separate bowl, adding more water to thin if necessary. 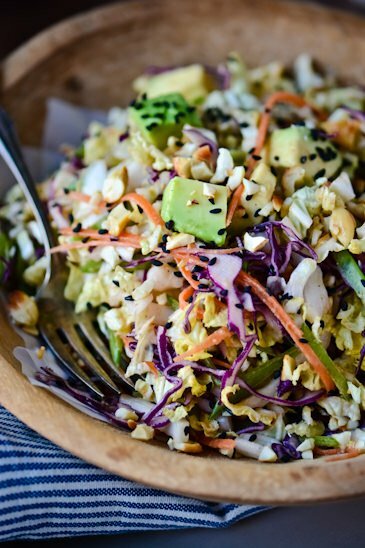 Toss the cabbage mixture with the peanut sauce and top with the reserved herbs, cashews and sesame seeds. My dear husband made this tonight for dinner and it is one of my new favorite things! Had it with olive oil, lemon, red pepper Marinated grilled shrimp. Delicious! This looks absolutely amazing and something my body is craving! I can eat salad every day too – and would be happier with something like this prepped for a couple days. Great recipe! I usually prep a large portion and then just dress it when I’m ready to serve it. I just looked at your site, it’s lovely! I made this tonight. We are growing green and red cabbage in our garden so I didn’t use Napa cabbage. Also I forgot to buy the snow peas and the basil and the fresh ginger but I used some powdered which worked in a pinch. I also users less sriracha for the kids sake. I served it with teriyaki chicken and sushi rice.It was great. I will make it again. Regular cabbage works just fine in this recipe, I’ve definitely done the same. The nice thing about this salad is that you can use what you have in the veggie drawer. I do think the herbs really add something to the mix but I am really into fresh herbs in almost all my dishes! I’m making this for dinner tonight! It looks delicious, and I’m excited about it. 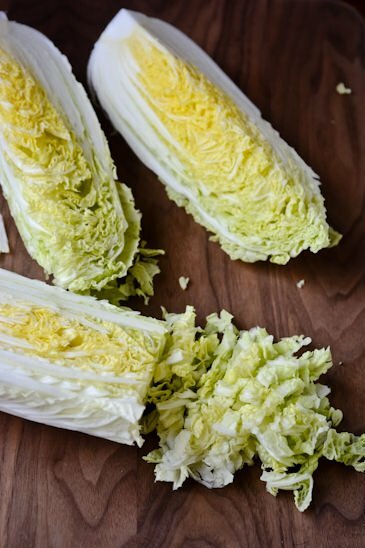 I love colorful food, and I’m also glad to add another cabbage recipe to my repertoire. Thanks! I eat with my eyes as much as my stomach. I have to admit that I judge a dish my appearance before flavor sometimes I hope you enjoy it! Do you know how many calories are in a serving of the dressing? Looks delicious! My daughter is allergic to peanuts. How would the dressing taste without the peanuts? You could make it without the peanut butter or try using tahini (sesame seed paste) instead. You could also just toast 2 tablespoons of sesame seeds in a dry pan and then crush them with a mortar and pestle. Let me know how it works out if you try it! Hi Cindy, I’ve tried making the dressing using miso paste instead of the peanut butter – it’s delicious, give it a try! For peanut allergies, if other nuts aren’t an issue try replacing peanuts with almonds. This was awesome but I had to double the sauce. Even my fiancé liked it. I’m glad you liked it. I like my salads to be dressed pretty lightly and the size of your cabbage can really make a difference. I know it didn’t have a lot of extra when I made it. Thanks for trying the recipe! This salad looks and sounds fantastic. I see a trip to the Grocery store in my future. Thanks for the recipe, my family loves salad! I’ve been really pleased to hear that this has gone over well with a lot of my friends kids and those that don’t necessarily love salads. I hope you enjoy it! I just tried this recipe yesterday and it was sooooOOoOOoOooo GOOD! Mouth wateringly good! I posted about it on my blog! http://www.pinkapron.weebly.com I love all the recipes you have here and I see myself trying many of them! I’m so glad you liked it. It’s been the most popular post on my blog this year. I checked out your post and I have to admit that I like my salads big! Hope you enjoy all the leftovers! If it gets a little bland ad a squeeze of lime juice or a tiny bit of vinegar to freshen it up! This salad looks delicious! I am going to try this with dinner next week. Love your photos too. Tina, I posted on this recipe before but I wanted you to know that since adding this recipe to my blog http://www.newpinkapron.com, that sooooo many people have tried it and everyone is OBSESSED with the peanut dressing! As am I! I keep a huge tupperware container of this salad in my fridge at all times. I usually make up a double or triple batch of the dressing and keep it in the fridge for quick salads. It is so delicious! I’m so glad that you liked the dressing. It’s also great tossed with some noodles! Thanks again for trying the recipe! Ok I have bee looking for salad inspiration and this is it…will try it this weekend. The dressing sounds delish! It’s one of our favorite dressings, it’s also great tossed with some noodles as well! I hope you enjoy the recipe! Sriracha is an Asian chili garlic sauce so if you can’t find it substitute your favorite hot sauce. Start with just a little bit and taste to suit your palate. Hope you enjoy the recipe if you try it and thanks for checking out the blog! Thanks for trying the recipe Ryan, I’m so glad you liked it. It’s one of my favorites too! Has anyone tried this without the sriracha? I don’t like Spicey food at all, so I was just curious of removing it from the recipe would take away from the flavor of this dish. 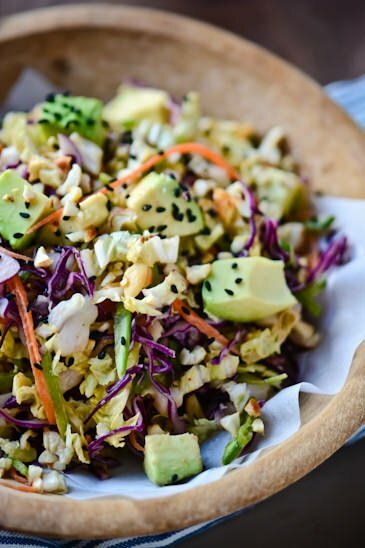 You can definitely make the dressing without the sriracha, with the rice vinegar, garlic and ginger you have plenty of strong flavors and you won’t even miss the heat! Hope you like it if you try it! I can’t wait to try this- sounds Delish!! I hope you like it, it’s one of my favorites! I’m so glad you like it, it’s one of my favorite dressings as well! So good! I had to make like twice the dressing which probably decreased the health benefits somewhat but it made 2 huge portions with enough left over for my lunch tomorrow. We topped it with seared tuna and dinner was done. Will add this to the rotation for sure! I don’t like a lot of dressing on my salads normally and the amount of dressing you’ll need really depends on the size of your cabbage. I’m so glad that you liked it! This is delicious!! I just made it and substituted a few veggies. Added chopped broccoli and thinly sliced red onions instead of snow peas and red cabbage. Used flax seed and almond butter. Yum with extra sriacha drizzled on the top. This salad kind of reminds me of Houston’s thai steak salad. Just add steak, mango and tomato and you’ve got it. Hi Lana, I’m so glad you liked it. It’s a really versatile recipe and I like to mix up the veggies I add as well. Thanks for trying the recipe! Hi, thanks for the crunchy salad recipe. I do have a question without compromising the asian flavor how can I make the dressing without the gluten in the soy sauce? Any ideas? 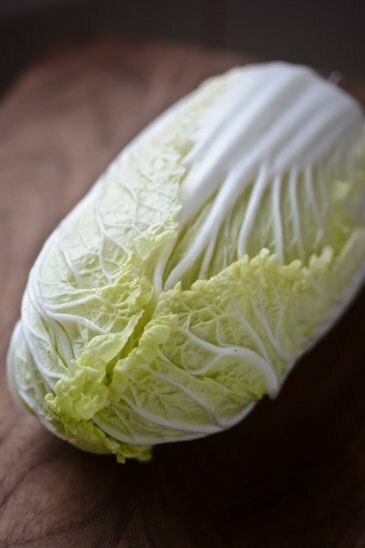 Many thanks for sharing this cabbage recipe. You could substitute tamari which is wheat-free and it wouldn’t change the flavor at all. Coconut aminos or Bragg’s liquid aminos are also a good option. Some fish sauces are also gluten free but you should double check before trying them. Let me know how it works out for you! I’ve made this recipe twice and it’s as good as it looks!!! This salad is soooo amazingly delicious. My 10 year old son, who doesn’t even like salad, loved it! The dressing is simply fabulous… and I would recommend making extra and using any leftovers for spring rolls. If you need a fabulous favor filled salad serve this… your guest will be begging for the recipe. 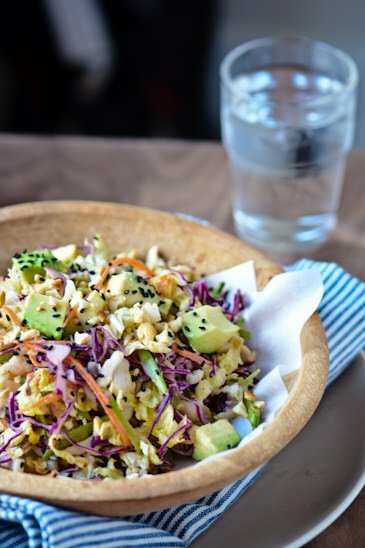 Many thanks for sharing crunchy cabbage salad! simply delish:)! I’m so glad you liked it! The dressing is also great on soba or your favorite noodles. Thanks for trying the recipe! After pinning this a long time ago, I finally got around to making it. Really. Delicious. Love the dressing. This will definitely be a regular on the dinner table! Thanks for sharing! I’m so glad you liked the recipe, the sauce is so versatile I like to toss it with noodles or dip spring rolls in it as well! Made this today and loved it. Have had something similar in a restaurant here with sliced steak on top. Thanks for sharing the recipe. Made this tonight with a leftover bag of coleslaw mix just added the fresh herbs. Was delish!! Next time I plan on adding some shrimp! VERY appealing to the eye and hope for my tummy as well. Can’t wait to try this receipe. 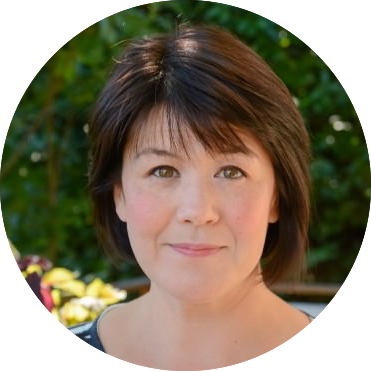 Will visit your site as well as this speaks to my living IN purpose ON purpose lifestyle! Very excited to try this salad! What’s the serving size for this dish? Thanks! The serving size really depends on how large your cabbages are. It makes 4 generous dinner size portions or 6 smaller salads. I hope you enjoy it if you give it a try! Sounds easy and delicious — going to make it tonight for dinner. I hope you enjoy the recipe! Let me know if you make any additions to it that you like! I made this for the first time today and it is awesome! This will be a regular lunch in our house. I think shredding the veggies thin is important – I’m going to be more careful about that next time. I’m sure it would be great with a variety of different veggies as long as the base was some sort of cabbage. I’m so glad you enjoyed it. I’m a huge fan of Pinterest myself and love finding new recipes to try. The dressing is also great on soba noodles or as a dipping sauce for salad rolls if you were looking for other ways to enjoy it! Hi, recipe looks amazing. I was caution calling it Gluten Free. Soya Sauce is not Gluten Free. Cheers! Thanks for checking out the recipe. 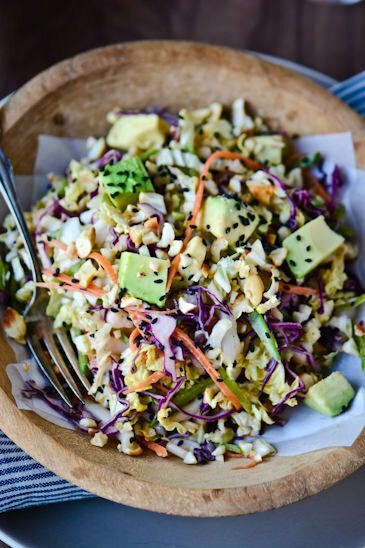 The salad isn’t listed as a gluten-free recipe but if you substitute the soy sauce with tamari or coconut aminos it will be! Made this tonight for the first time and it was delicious! I used all organic ingredients and only made a couple modifications. Firsr, I added chopped green onion. Second, I added shredded chicken that I steamed in some vegetable stock and Braggs liquid aminos. Lastly, to the dressing, I added 1/2 TBSP extra rice wine vinegar and a drop extra of Siracha. I will definitely make this salad again and have already forwarded it on to my family members. Thanks for trying the recipe! Poached shrimp is also a great addition. I agree about adding a little extra sriracha, I like it spicy! Great salad and dressing. I used regular cabbage, sliced almonds, Italian parsley because that’s what I had, topped with tuna. It’s a keeper. and yet so wonderful! I will definitely be making this salad again and again! Hi Tina, just spotted your recipe today. I’m LCHF-2 weeks into it and doing great. Can you please tell us the carb count-salad with and without the dressing per serving? It looks divine! Thank you so much for this! its so easy to make and delicious! Thanks so much for trying the recipe, it’s one of my favorites! I made this a couple of days ago and I def made a mistake by adding the dressing and then refrigerating it for several hours. The dressing lost all its flavor! I was very disappointed because the dressing tasted great! So I will def add the dressing just before eating. I’m sorry that the dressing let you down. It is best served right after dressing but you can revive it with a little squeeze of lime or a dash or vinegar. The acid breaks down and causes the dressing to taste a bit flat but it isn’t a lost cause. Thanks for trying the recipe! This is phenomenal! Served it with grilled salmon I marinated in soy, ginger, garlic and sesame. My husband loved it. Thanks, Emily, I’m so glad you enjoyed it! The vegetables take a bit of preparation so I like to make a huge batch and leave the salad in the fridge without the dressing so I can portion it out for a few days worth of lunches! Thanks again for trying the recipe!